Modern eco style for green families is literally just a stone’s throw away with Iglooplay‘s new Throwing Stones pillows. These plush pebbles are set to debut at the upcoming BKLYN Designs exhibition, May 7th-May 9th in DUMBO, Brooklyn. Imbued with the spirit of river stones, Iglooplay’s sculptural cushions are designed for children and adults alike — for multi-uses as chic and cushy floor seating, lounging pads, and stacking toys. Throwing Stones are upholstered in 100% wool slip covers over a bamboo fill, and encased in a cotton/bamboo liner. Available in nature inspired colors of amber, granite and stone. Check out our other Iglooplay design favorites: toyChaise, craftWork table and chair, Mod Rocker and Tea Pod! Modern eco style for green families is literally just a stone's throw away with Iglooplay's new Throwing Stones pillows. These plush pebbles are set to debut at the upcoming BKLYN Designs exhibition, May 7th-May 9th in DUMBO, Brooklyn. 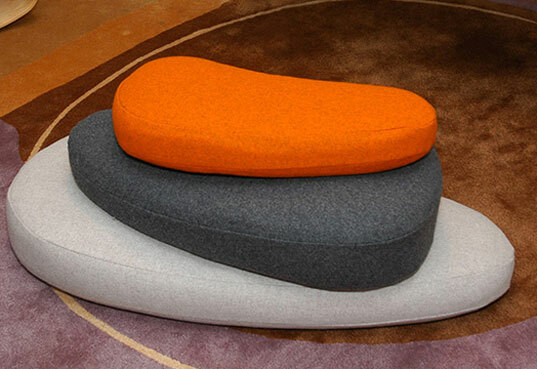 Imbued with the spirit of river stones, Iglooplay's sculptural cushions are designed for children and adults alike -- for multi-uses as chic and cushy floor seating, lounging pads, and stacking toys. Throwing Stones are upholstered in 100% wool slip covers over a bamboo fill, and encased in a cotton/bamboo liner. Available in nature inspired colors of amber, granite and stone. Check out our other Iglooplay design favorites: toyChaise, craftWork table and chair, Mod Rocker and Tea Pod!